After such a long cold winter, I’ve finally managed to get some seeds in this weekend. 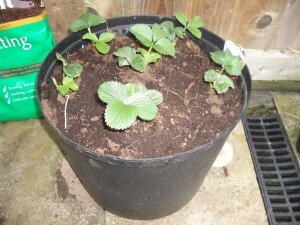 I had some garden vouchers for my birthday, and yesterday I went to the garden centre and bought seeds, potting compost, some strawberry plants, two blackcurrant bushes and a rhubarb plant with them. I’ve put the strawberry plants into a big tub on the patio. It’s sunny there, so they should do well. 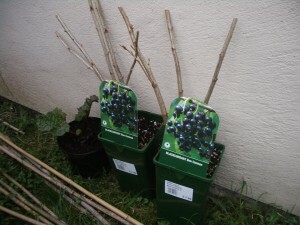 The blackcurrant bushes and rhubarb are sitting behind the garage waiting to be put in the border by the wall. I also planted some pumpkin seeds, runner beans and tomatoes. Last year I still planted too many seeds. This time I’m going to limit the number of plants I grow and keep the seeds left over in an airtight box ready for use next year. Have you been able to get out in your garden yet? What have you been planting? I hope you tested the warmth of the soil by putting your bottom on it!!!! No – I haven’t planted anything yet. The soil at the allotment is still far too cold. I am so sick of seeing my seed potatoes sitting on the windowsill though – I am desperate to get them in.